Scott Blumstein, a Temple University graduate and Philadelphia resident, holds up the bracelet after winning the World Series of Poker main event, Sunday, July 23, 2017, in Las Vegas. 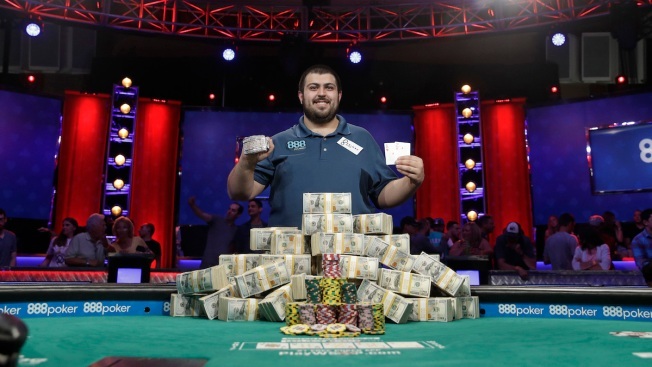 A recent Temple University graduate took his place atop the poker world early Sunday by winning the world's biggest poker tournament — and hauling in $8 million. Scott Blumstein, a native of northern New Jersey who lives outside Atlantic City, took down the last two competitors at the final table of the 2017 World Series of Poker main event in Las Vegas. He held a commanding lead going into the final night of play that started Saturday evening, and was one of more than 7,000 that started the tournament. The 25-year-old, who was described by Poker News as "an East Coast tournament grinder," entered the night with a commanding lead. A grinder is a player who spends a lot of time at the poker table and who considers poker a career. The win "changes my life," he told ESPN, which broadcast the event. Entering Saturday, Blumstein had 226 million chips, compared to the second-place chip-holder Dan Ott's 88 million and Benjamin Pollack's 45 million. Ott is also a Pennsylvanian who hails from Altoona. Pollack is a French poker professional. Despite the win, Blumstein isn't getting overly confident just yet. "If you had to ask me, probably the two guys I would least want to get three-handed with," Blumstein told ESPN. "But with that being said, I have a lot of chips and I'm confident we're going to go home, work on some three-handed poker, and come back ready to play tomorrow." Blumstein graduated from Temple three years ago with a degree in accounting. According to his Twitter account, he's a "professional liver." In the mean time I'll be off the grid for the next few days. The support means so much. Can't wait to thank everyone when this is all over. He'll likely be a professional poker player for the considerable future. The $8.15 million isn't be his first big score in a poker tournament. He won nearly $200,000 in a tournament at the Borgata in Atlantic City last year. The final three players, from left, Scott Blumstein, Benjamin Pollak, of France, and Dan Ott stand at the final table during the World Series of Poker, Friday, July 21, 2017, in Las Vegas.